Australia and New Zealand are, jointly, the most ‘giving’ countries in the world according to a new International 'Giving" Index. Australia and New Zealand are, jointly, the most ‘giving’ countries in the world according to a new “World Giving Index 2010” (WGI 2010) report issued by the international Not for Profit, Charities Aid Foundation (CAF). CAF says Australia and New Zealand both boast a World Giving Index score (the average of their scores on ‘giving money’, ‘giving time’, and ‘helping a stranger’) of 57%. Eight other countries from three regions also have a World Giving Index score of over 50%. The Index ranked Australia and New Zealand as the most charitable nations in the world, followed by Ireland and Canada in third and fourth place respectively. The United States tied for fifth place with Switzerland. The Index shows Australasia is the region with the highest incidence of giving money, highest for volunteering time, and the second highest for helping a stranger. Overall giving money outstripped helping behaviour by an average of 5%. Both USA and Canada showed the highest level of helping behaviour in the world with an average of 67% having helped a stranger. The region ranked second highest for the percentage of people giving money and third for volunteering time. CAF says happy nations are more likely to give than wealthy nations. According to the Index, the link between the giving of money and happiness is stronger than the link between the giving of money and the GDP of a nation. The review of the state of giving in 153 countries representing 95 percent of the globe’s population is described as the most ambitious study of its kind to have ever been attempted. nations that have not been included in previous surveys on giving. 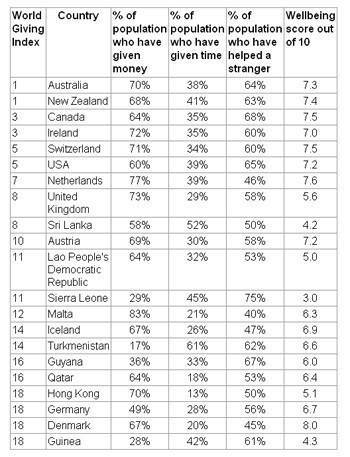 The Index, compiled from data from an ongoing international Gallup survey, ranking countries in three categories: what percentage of the population donated to a charity; what percentage of the population volunteered time to an organisation; and what percentage of the population helped a complete stranger or someone who they didn’t know who needed help. First place ranks in the individual categories of the World Giving Index went to Malta with 83 percent of its population giving money, Turkmenistan with 61 percent volunteering time to a charity, and Liberia with 76 percent of its population willing to help a stranger. CAF America CEO Susan Saxon-Harrold says the World Giving Index is a broad-based survey and it provides a unique overview of global philanthropy. She says it will give many governments a means to set benchmarks for giving and define areas where improvement is needed. CAF Australia Chief Executive, Don Willesee says Australians have a long and deserved reputation for giving and it's rewarding to see that against international giving trends. Willesee says the report found that those who are more satisfied with life were more likely to give to charity than those who are wealthy, which perhaps follows Australia’s generally high quality of health, stability and lifestyle. He says CAF in Australia is seeing growing personal and company awareness and involvement in planned giving and donors are becoming more demanding in seeing what happens with their donations. Willesee says that government legislation and support with pre tax giving and promotion over the past decade is helping Australians to realise the benefits that are available to their charity and themselves through regular planned donations and volunteer commitment. The international report reveals the sheer variety and complexity of ways in which individuals contribute to their communities in 153 countries around the world. Enormous variation is seen in how countries and regions ‘give’. The incidence of giving money to charity ranges from as low as 4% in Lithuania to as high as 83% in Malta. Incidence of volunteering lies in a range from 2% in Cambodia to 61% in Turkmenistan. Each country has its own unique footprint and its own way to give. In Liberia, less than one tenth (8%) of the population give money to charity every month. Yet over three-quarters (76%) of Liberians help a stranger every month, more than any other country in the world. CAF says helping strangers is the main way that the world gives. Overall, 20% of the world’s population had volunteered time in the month prior to interview, 30% of the world’s population had given money to charity, and 45% of the world’s population had helped a stranger. While this report has some interesting aspects (giving trends as you age) the basic overall index is flawed. Including self-reported helping of a stranger metric is a little bizarre and hard to see how that compares with parting with money or providing real time to a charity. Further the methodology is flawed because it does not measure the level of participation. If I am a guy that gives 50% of my wealth away but does not spend time at a soup kitchen nor necessarily help an old lady across the road (in the last month) I am seen as lower on the giving index to a billionaire who flicked $1 into a homeless person’s box, sat around a charity board table talking about myself and offered investments advice to someone (helping a stranger)??? Also in the end Australia is 1% better than a bunch of other countries…Where is the margin for error (5%) which adds or subtracts 2.5 points which changes everything….. I agree with Daniel. This index is totally flawed and has no real value. Why is “helping a stranger” even part of the criteria? Why not include “being polite to people” or “putting your rubbish in the bin”? What is the weighting given to money vs time? I’m pretty sure I could come up with a dodgy survey like this which calculates that Australians are the most beautiful people in the world. If this article is considered to be scientific, I’d say Aussies certainly aren’t the smartest.